Pretty much all of my t-shirt design decisions are ideas that I’d want to wear. And by the looks of my Spreadshirt Shop, I want to wear some pretty eccentric stuff—I’m all over the place. Influences from my entire life are on display: skateboarding, punk, hip-hop, and typography (among others I’m forgetting). 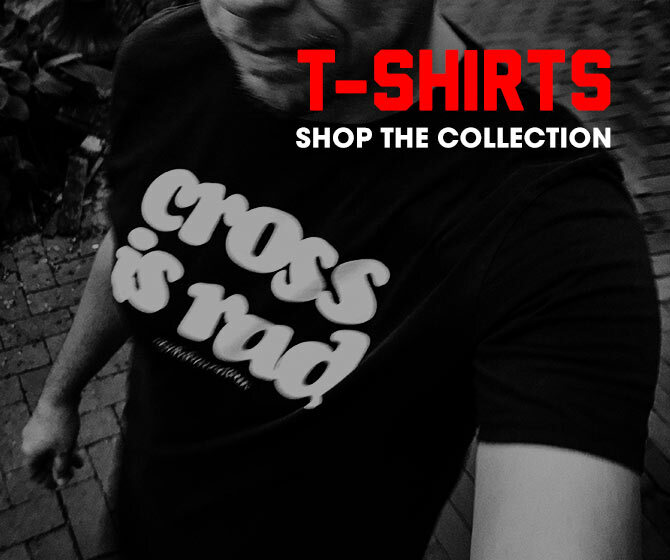 Never a more obvious statement—cross is pretty freaking rad. And, obviously, so is De La—so I captured the Soul and remixed it with the rad. I’ve always loved the album cover for “Stakes Is High” and for some reason it popped in my head a few weeks ago. After painstakingly handcrafting the small-batch, artisanal, Cooper Black Oblique type into the shape I desired, here we are. This one’s for lovers of cyclocross, De La Soul, and big-assed type. Available for women and men. File under: shirts I want to wear. You’re more than welcome to grab one for yourself if you agree.